RStudio Connect is the publishing platform for everything you create in R. In conversations with our customers, R users were excited to have a central place to share all their data products, but were facing a tough problem. Their colleagues working in Python didn’t have the same option, leaving their work stranded on their desktops. 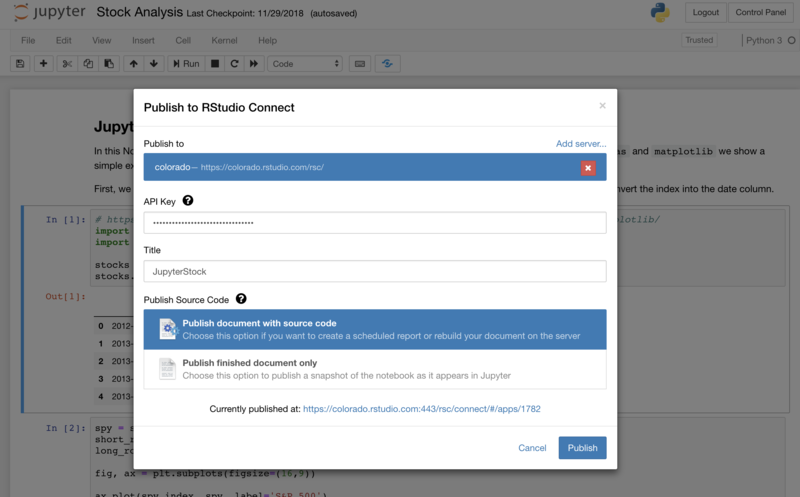 Today, we are excited to introduce the ability for data science teams to publish Jupyter Notebooks and mixed Python and R content to RStudio Connect. Connect 1.7.0 is a major release that also includes many other significant improvements, such as programmatic deployment and historical event data. We encourage existing customers to upgrade. We also welcome anyone who has not yet experienced RStudio Connect to try it today! RStudio has often provided support for other languages frequently used with R. Earlier this year, we announced the reticulate R package and IDE support for creating projects that use R and Python. Now, these projects are fully supported in RStudio Connect, as well. Whether you’re creating a reticulated Shiny app, a Plumber API that calls Python, or an R Markdown document that mixes Python and R, RStudio Connect will automatically re-create both the R and Python environments! Note: Server administrators need to add a Python configuration for RStudio Connect. Data science teams in the enterprise can include people who use RStudio, Jupyter Notebooks, or both. Now RStudio, Jupyter, and JupyterHub users can publish and share the data products they create every day in one convenient place. Jupyter Notebooks can be published to RStudio Connect using a Jupyter extension. Notebooks are published as static HTML files, or the notebook source can be published. When the source is included, RStudio Connect automatically restores the Python environment and the Jupyter Notebooks can be re-executed, emailed, and scheduled. As data products become critical to organizations, RStudio Connect users have requested more flexible deployment options. Enterprise workflows sometimes require approvals to publish to production environments. For example, content stored in Git may be published to separate QA or Production environments based on IT approvals. In RStudio Connect 1.7.0, we’ve added support for programmatic deployment in the RStudio Connect Server API. These new APIs let your deployment engineers craft custom deployment workflows. We have created example scripts showing how to use the content APIs to deploy a Shiny application. RStudio Connect now collects and surfaces data you can use to answer how often your data product is being viewed, whether it needs updating, and who is using it. 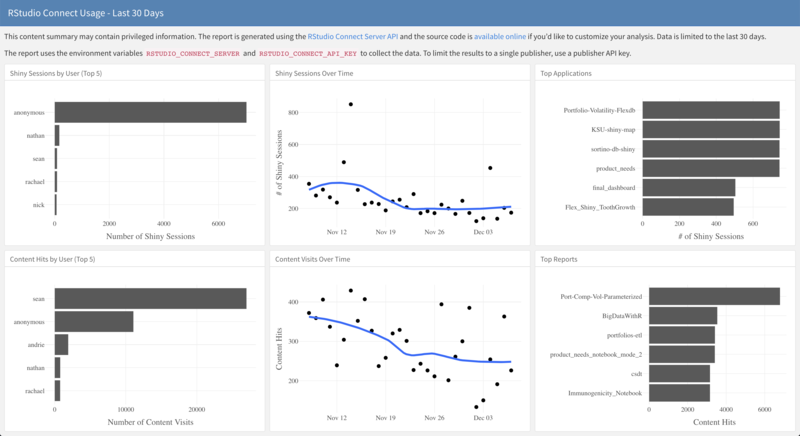 For reports, dashboards, plots, and notebooks, RStudio Connect records “who, what, and when” for each visit. This data is available to publishers and admins through the Connect Server API. We’ve created a sample dashboard you can use out of the box or as a launch pad for your own analysis! Bundle Uploads Better protection against malicious bundle uploads that previously may have written outside the content directory. Brute-force Protection A brute force attack protection has been added for interactive authentication attempts. User Profiles Admins can now prevent users from editing their profiles for all authentication providers. Additionally, Connect better handles email values supplied by authentication providers, fixing a bug that would prevent users from logging in. See the release notes for details. Audit Improvements All modifications to users and groups done via the usermanager utility are reported in the audit logs. Unique Users RStudio Connect better enforces unique users. The usermanager utility has multiple updates, making it easier to fix broken user accounts. Proxied Auth Improvements Installations using a custom authentication provider can provide complete user profiles through proxy headers, removing the need for users or admins to update profiles manually or via the Connect Server API. Programmatic Group Management The Connect Server API can be used to create and manage groups for installations using Password or OAuth2 authentication methods. Breaking The deprecated OAuth2.DiscoveryEndpoint configuration value has been removed. Deprecation The configuration setting Password.UserInfoEditableBy is deprecated in favor of Authorization.UserInfoEditableBy. Future releases will remove the setting entirely. If you haven’t yet had a chance to download and try RStudio Connect, we encourage you to do so. RStudio Connect is the best way to share all your data science work (Shiny apps, R Markdown documents, Jupyter Notebooks, plots, dashboards, Plumber APIs, etc.) with collaborators, colleagues, or customers.